We're well into the holiday season, a time to be spent with loved ones and a great opportunity to exchange gifts. 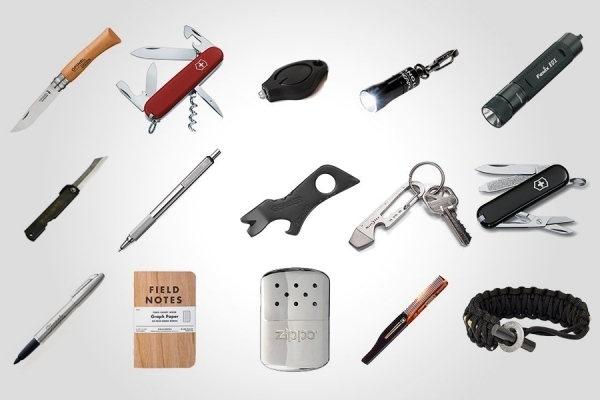 If you're still having trouble deciding what to add to your wishlist, or if you've put off shopping because your minimalist wallet is feeling especially light these days, don't worry — we've got you covered with this collection of 15 great pieces of EDC gear for under $15 each. Something as essential as keys deserve better than a flimsy, generic keychain. This multitool is an easy upgrade over an ordinary carabiner, offering versatility with its pry bar, box opener, screwdriver, ruler and wrenches. Its solid stainless steel construction will give you the peace of mind that it'll reliably handle your day-to-day and keep your keys secure. 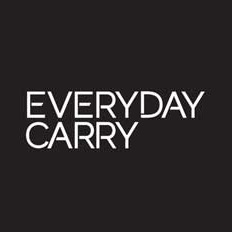 According to our database, this is one of the most popular EDC items in our community, with good reason. For its price, it makes for a surprisingly good keychain tool, and has done so for years. Its simple, single-piece construction boasts durability and just the right variety of well-executed tools for common daily tasks. A substantial Philips screwdriver, pry bar, and bottle opener add utility to any set of keys. The Classic is the quintessential keychain knife if there ever was one. It makes practically any keychain better, and makes for a great "backup" for people who carry primary tools. Even still, the tweezers and surprisingly good scissors are handy functions to have for daily tasks. Its blade might be small, but it's sharp, precise, and works well in a pinch. People who might not be super enthusiastic about EDC (yet) would still appreciate this little tool. 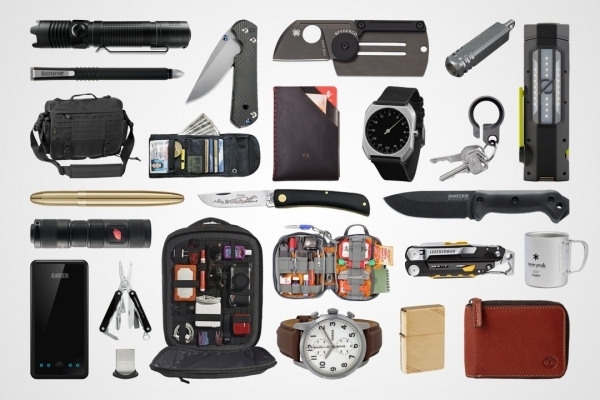 Gifting a Swiss Army Knife is a sure bet for any guy, let alone an EDC enthusiast. The Spartan II in particular hits a nice balance of versatility and minimalism with its feature set: a highly capable main blade, a smaller blade for precision work, two screwdrivers, and other handy tools. It’s backed by Victorinox quality, so whether it gets EDCed or not, it’ll be a reliable gift that keeps on giving. This handsome classic French knife is a simple, non-threatening EDC that can get the job done for most daily tasks, from general utility to mild food preparation. Its carbon blade will sharpen easily and take on a nice patina with use and carry. Light weight, comfortable handles and simple operation make it a great gift to get someone familiar with the world of EDC knives. This is a simple, reliable, bomb proof flashlight that seems to last forever off of a single AAA battery. Its beam may not be the prettiest, but the light makes up for it with its durable construction, easy twist-operation, and ability to act as a "candle" in an emergency. It's a great gift for those who appreciate practical items and makes for a good introduction if you want to infect your loved ones with the high-end flashlight bug. This tiny LED flashlight manages to push out a respectable 10 lumens for up-close, light duty illumination tasks, and is easy enough to carry on a keychain. It's similar to the aforementioned light in its twist operation and output, but it cuts down on some of the bulk at the expense of a smaller, less-common battery. Great for minimalists who don't want to add much more bulk to their keys. Another solid keychain light, this is the "real deal" when it comes to this style of 5mm LED pushbutton lights. It's higher quality, durability, and performance in the same compact profile as those familiar freebie LED lights. It'd be right at home on a keychain or as a zipper pull inside a dark and cluttered bag. Add a sense of luxury to this beloved office supply product and never deal with snapped pocket clips or worse — leaks in your pocket or bag! For someone who uses permanent markers often, it's an economical gift as it can take refills as well. Its stainless steel body adds that durability and substance that will make the pen as permanent as its ink. These memo books are among the most popular pocket notebooks in the EDC crowd. At under $10 for a 3-pack, they're an especially great value. Keep one around for making lists, journaling, doodling, or taking notes on-the-go. With so many covers to choose from, you're sure to find something that will suit whoever you're shopping for's style. A great entry-level EDC pen and longtime crowd favorite, this stainless steel pen features a no-frills industrial design, knurled grip, and durable construction. A retractable tip, pocket clip, and tough-as-nails barrel make it a reliable EDC. Cheap, ordinary plastic pocket combs don't stand a chance in your pocket, while some of the beefier metal EDC combs can weigh you down and feel uncomfortable on your 'do. This handmade pocket comb is smooth to the touch, folds into its handle to protect its teeth, and even comes with a pocket clip for effortless daily carry. It's a great gift for the guy who's gotta keep his hair on point throughout the day. Sometimes, gloves don't quite cut it when it comes to fighting off the cold. This pocketable hand warmer can keep your hands comfortably toasty even when it's mad brick outside. It's a safe and reusable upgrade to the disposable hand warmers, making it a great winter EDC item. Paracord is highly regarded as an indispensable survival item due to its versatility and strength. This bracelet combines not only paracord, but a fire starter as well, into an easy-to-carry piece of kit for wherever your next adventure takes you. We hope this guide gives you some inspiration for all your shopping this holiday season! Are we missing any great recommendations for under $15 in the list above? Leave us a comment below with what you think should've made it to the list. Happy holidays!